ISLAMABAD: Prime Minis­ter Nawaz Sharif on Saturday named the new military command, appointing Gen Qamar Javed Bajwa and Gen Zubair Mahmood Hayat as the chief of army staff and the chairman of the Joint Chiefs of Staff Committee (CJCSC), respectively, in the hope of stabilising the fragile civil-military balance. The appointments were set in motion by the impending retirement of incumbent army chief Gen Raheel Sharif and CJCSC Gen Rashad Mehmood and put to rest feverish speculation regarding who would succeed Gen Raheel Sharif — the first army chief to retire on time in around two decades. While the office of CJCSC is technically the more senior position — as he serves as the principal military adviser to the prime minister and the National Command Authority (NCA) — the office of army chief is the most prized and arguably the most powerful position in the country. Gen Bajwa is an infantry officer, while Gen Hayat hails from the artillery. The latter has the honour of being the first gunner to become a four-star general since Gen Musharraf retired in 2007. Both officers are from the 62nd Pakistan Military Academy Long Course and were commissioned in the army in October 1980. “President Mamnoon Hussain has, on the advice of Prime Minister Nawaz Sharif, appointed Gen Zubair Mahmood Hayat as chairman Joint Chiefs of Staff Committee and Gen Qamar Javed Bajwa as chief of army staff,” the announcement from PM House said. Soon after the announcement, both officers called on PM Sharif. There is an unwritten tradition in the army that superseded officers retire, but there have been exceptions. However, the decision to supersede four generals — particularly the battle-hardened Gen Ishfaq and Gen Javed Ramday — is bound to set tongues wagging among the military’s ranks. The seniority list has almost never been strictly followed in appointing army chiefs. The list was followed most closely in 2007, when Gen Ashfaq Parvez Kayani — the senior-most officer — was appointed army chief after Gen Musharraf doffed his uniform. Both Gen Bajwa and Gen Hayat lack the experience of active combat because neither has been posted in a conflict zone. The army chief-designate is, meanwhile, credited with having spent a considerable part of his military service in the Rawalpindi-based 10 Corps, which is responsible for guarding the Line of Control (LoC). However, his time at the 10 Corps was a period of relative quiet following the 2003 ceasefire accord. Gen Bajwa’s relatively more moderate view of the relationship with the civilian government, it is said, proved to be the decisive factor in PM Sharif’s decision. One of Gen Bajwa’s former commanding officers told Dawn the COAS-designate is a strong proponent of the army not intruding into civilian space. Under the watch of the outgoing army chief, the civil-military balance of power had titled more in military’s favour. The fight against terrorism, it is believed, would remain unaffected. Gen Bajwa, his colleagues say, is a firm opponent of extremism and terrorism. According to an insider, he may prove even more forceful in the fight against terrorism than his predecessor, who is credited with launching Operation Zarb-i-Azb, which helped lower the frequency of terrorist attacks. The immediate and foremost issue requiring the new army chief’s attention would be the situation on the LoC, where the violence has escalated over the past two months, even though the relationship has generally been tense ever since Narendra Modi came to power in India. Second on the priority list for the incoming chief would be consolidation of the gains made in the fight against terrorism. Terrorist attacks in Mohmand Agency and Gwadar on the day Gen Bajwa was named were in themselves reminder that the fight was still not over. The third front requiring his immediate attention would be team building; he will immediately need to appoint a chief of general staff — a key posting that runs the army’s day-to-day operations — after the promotion of Gen Hayat. In addition, the supersession of four generals could force a major reshuffle within the top brass if they decide to step down. GEN Zubair Mahmood Hayat, the new Chairman Joint Chiefs of Staff Committee. Gen Hayat was always expected to become the CJCSC, given his career trajectory. As a three-star general, he served as director general of the Strategic Plans Division (SPD), which is the secretariat of the NCA, and Bahawalpur corps commander. This made him an ideal choice for the post of CJCSC, which has an almost exclusive jurisdiction over Pakistan’s nuclear forces and assets. 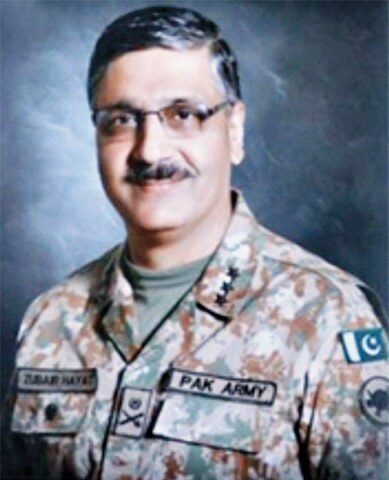 He is generally seen as Gen Ashfaq Parvez Kayani’s protégé.